In February, 2017 His Highness Sheikh Mohammed bin Rashid Al Maktoum issued a challenge to Dubai government entities to identify, describe and launch new programs to preemptively disrupt their sectors and define a new exponential future from Dubai. Working alongside the innovation team of Dubai Electricity and Water Authority (DEWA), our strategy team evaluated DEWA’s current service portfolio and analyzed ongoing programs for exponential opportunities. The team shortlisted 10 projects spanning the entity’s portfolio to define a new future for utility services. These projects were then collected into four thematic pillars: solar energy, energy storage, automation and digital services. 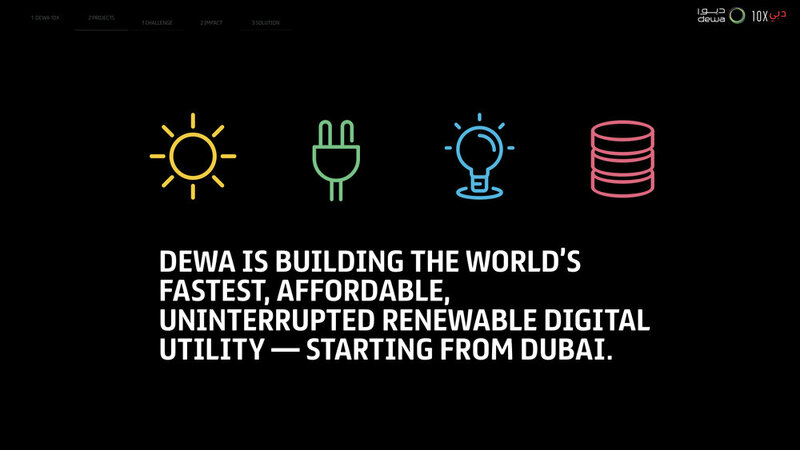 Following the initial discovery exercise, the team then conducted deep-dive research, engaged with internal and external stakeholders and benchmarked the value chain, organizational structure and product portfolio to identify a landmark new opportunity for the utility provider: Rather than disrupting a part of its business with 10X, DEWA will disrupt the entire business by creating a brand new digital agency. Digital DEWA is an independent business unit representing the future of DEWA and redesign the role of utility in the modern era. We continue to work with both DEWA and Digital DEWA on strategic advisory for the 10X program across multiple functions, and report directly to the C-suite and board of directors.